This post is part of my popular toilet paper review series. No one likes to throw money down the toilet by spending more than necessary on toilet paper! This series helps you check out the cheaper toilet paper options and save some money. This post is a review of Willow toilet paper from Aldi. 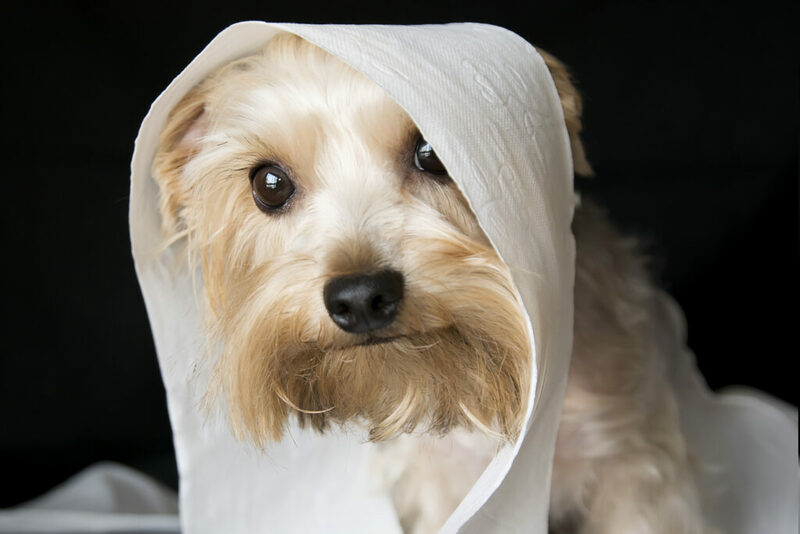 If you’d like to read more, check out my full guide to cheap toilet paper. You may think of Aldi for cheap snacks, eggs, or milk, but have you ever tried their paper products? In this post, I look at Aldi’s toilet paper options. Which Toilet Paper Brands Do Willow Compare To? How did Aldi Willow toilet paper really STACK UP to the brand names? Strength: the amount of weight can it hold before ripping. Softness: how soft does it feel on the skin (opinion). Thickness: thickness, based on how it looks and how it feels. Absorbency: the amount of water can it absorb. Comfort: my personal opinion on how nice it feels. Lint-free: how well it avoids leaving lint around the bathroom and on your behind. Dissolvability: speed of dissolving into little pieces in cold water. Price: number of sheets per dollar, as compared to the name brands. I did not enjoy Willow So Soft toilet paper from Aldi. It’s thin, scratchy, and uncomfortable. It definitely feels like “bargain toilet paper”. Willow Soft & Strong is a great value for the money. If you’re not looking for ultra plush toilet paper, I think it’s a good choice. Overall, I’d give it a “not bad” as far as comfort. Willow Ultra Soft really is pretty soft and comfortable. It is a bit of a linty mess, though. Willow Ultra Strong is not quite as soft as I prefer, but it seems like a pretty good quality. For those who like the “strong” types of toilet paper, I think it’s a fair-priced option. How Does Willow Toilet Paper Compare To the Name Brands? Whenever I see “compare to…” on a generic package, I’m also curious how it really compares to the brand name. I tried out the Willow toilet paper side-by-side with their “compare to” brand names to see for myself. Let me start this by saying that I think brand-name Angel Soft is pretty terrible toilet paper. 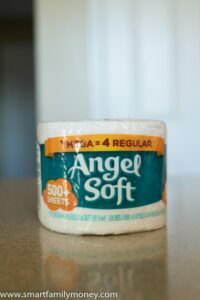 There is nothing soft or “angelic” about it! With that said, I think that Willow So Soft toilet paper is BETTER than Angel Soft. As you can see in the chart, Willow So Soft tested lower than Angel Soft for strength, but higher for thickness and absorbency. If I had to choose between the two, I’d choose Willow So Soft, but even if my budget were super-tight, I’d pass on both. I think Willow Soft & Strong is a better budget option. Honestly, the fact that Aldi says Willow Soft & Strong is “comparable to” Quilted Northern Ultra Soft & Strong is just silly. They’re completely different things. I feel like Willow Soft & Strong is pretty nice for a budget toilet paper. 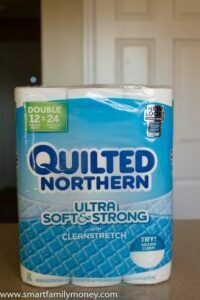 Quilted Northern Ultra Soft & Strong is a luxury toilet paper. Willow Soft & Strong is nothing like Quilted Northern Ultra Soft & Strong. The most immediate difference I noticed is that Willow Soft & Strong makes a crinkly noise like a cheap facial tissue. Quilted Northern Soft & Strong feels luxuriously soft and quiet. 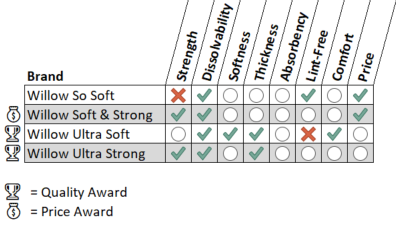 The chart below the test results of Willow Soft & Strong vs. Quilted Northern Soft & Strong. 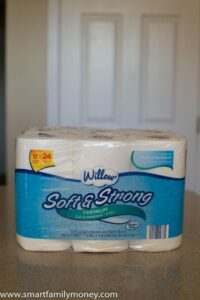 While I think Willow Soft & Strong is a good budget toilet paper, if you’re a fan of Quilted Northern Soft & Strong, you’d be very disappointed with the Willow version. 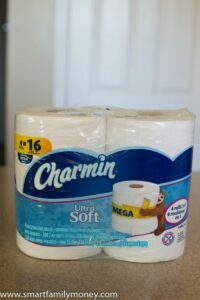 As you can see, Willow Ultra Soft has a few pros compared to Charmin Ultra Soft in addition to a cheaper price. Willow dissolves much better and is stronger than Charmin. Willow Ultra Strong is definitely “comparable to” Charmin Ultra Strong. They feel pretty similar. The main difference I notice is that Charmin is more flexible, while Willow is more stiff feeling. 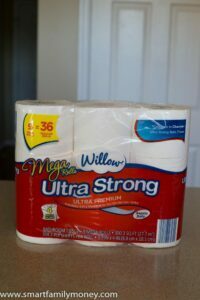 Overall, though, if you like Charmin Ultra Strong, you should probably give Willow Ultra Strong a try. I would certainly save you some money and help your plumbing. As you can see by the chart Willow Ultra Strong is softer and easier to dissolve than Charmin Ultra Strong. 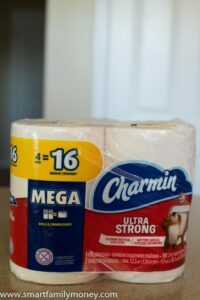 I wrote more about cheaper alternatives to Charmin Ultra Strong in my ultimate guide to cheap toilet paper. 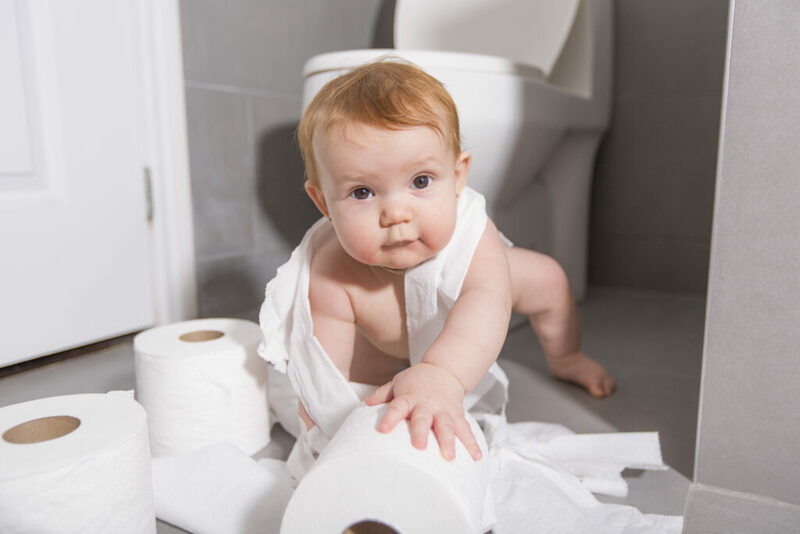 Is Willow Toilet Paper Safe for Septic Tanks? All of the types of Willow toilet paper from Aldi say that they’re safe for septic tanks on the package. My dissolvability test confirmed that they all dissolve into little pieces in water very quickly. They dissolve MUCH easier than all of the brand names I tested. I would say that all varieties of Willow toilet paper are a good choice for those with septic tanks. Is Willow Toilet Paper a Good Price? Willow So Soft and Willow Soft & Strong are both EXCELLENT prices. They are cheaper than almost every other 2-ply toilet paper out there. The only brand that is slightly cheaper is Kirkland Signature from Costco. I talk more about this in my post about the best value in toilet paper. Willow Ultra Strong and Willow Ultra Soft are both moderately good prices. If you don’t want to buy toilet paper in warehouse club sizes, they’re one of the best prices for a high-quality toilet paper. 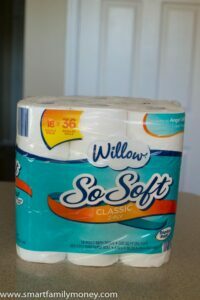 If you’re looking for a decent toilet paper at a great choice, I think Willow Soft & Strong is a good option. 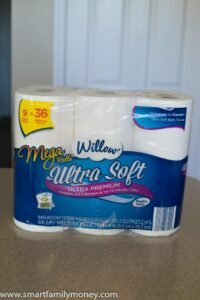 If you’re looking for quality higher than most generic toilet papers, I think Willow Ultra Soft or Willow Ultra Strong are good options. They are a good value compared to other options that you can buy at grocery stores, but they are not as good of a value as the warehouse club options. 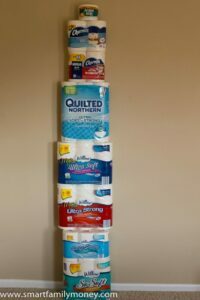 Check out my post about the best value in toilet paper for more about the warehouse club options. For thoughts on another good quality generic toilet paper, see my review of Amazon Presto toilet paper. 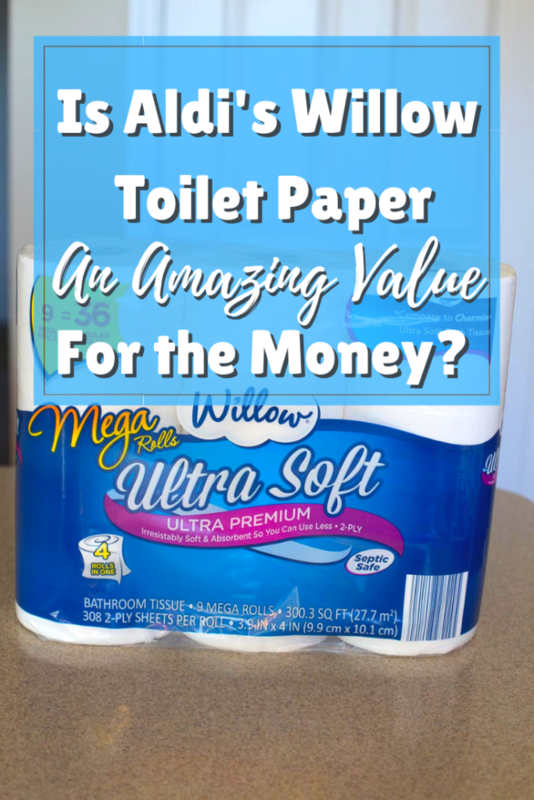 Bottom Line: Would I Buy Willow Toilet Paper? I will definitely finish the packages of all the varieties of Willow Toilet Paper I have now. Willow toilet paper from Aldi is not my first choice, but I would be open to buying the ultra varieties on occasion. 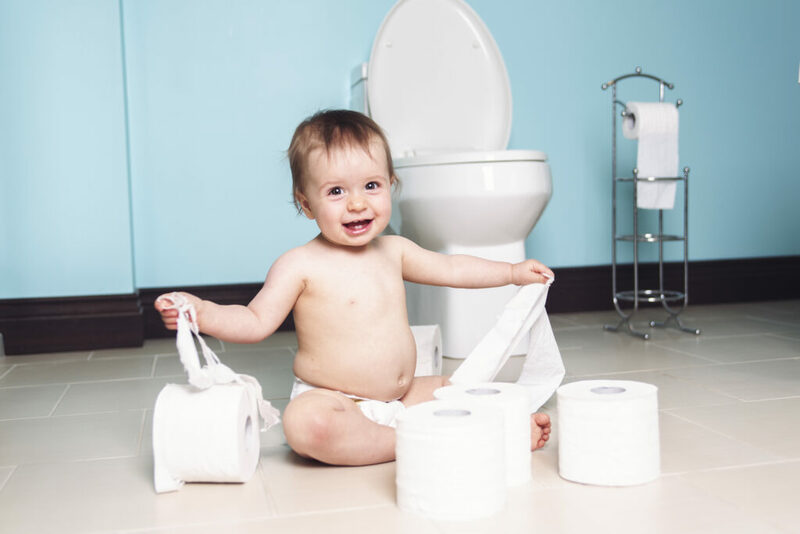 It is a good value for a toilet paper that is available in local stores without buying a huge quantity. For me, though, it doesn’t quite measure up to the quality and price of my current favorite, Member’s Mark toilet paper from Sam’s Club. I have been using Willow ‘So Soft’ for several years and have been very satisfied, until several months ago. For some reason the manufacturer is now using way too much glue making it a frustrating process to get a new roll started. I have to shred through several layers of paper, leaving pieces of paper on the floor, before the paper will roll smoothly. I will look for another product soon. This tissue paper was very thin and actually I used more because of the thinness. Will definitely not buy it again. Very disappointed. Which one? There are a variety of Willow toilet papers. The “ultra” varieties are definitely not thin. so glad i found this website. at aldis i bought willow strong and plush 3 ply this week and: it takes 2 hands to tear the paper off and even then it’s a bit of a tug. if i use one hand, it doesn’t tear off and a stream of it falls on the floor. i have never had this problem in my whole life. i will return to willow so soft classic 2 ply. I hope you find one you like! Aldi at least has a great return policy!